We acknowledge the traditional territories of the Coast Salish Peoples, on whose lands the Simon Fraser University campuses reside. 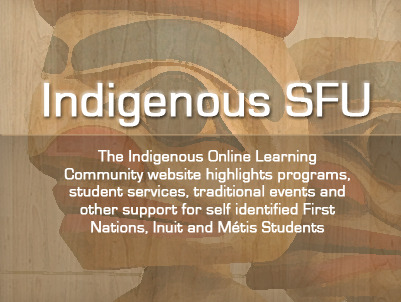 The Office for Aboriginal People at Simon Fraser University has created a new website to help Aboriginal students navigate the programing, funding and support available to them here at SFU. Graduate school provides programs beyond the bachelor's degree and it contains a more concentrated course of study in different academic fields. Graduate programs allow students to explore and analyze topics that they value. Graduate school offers opportunities for students to improve their research skills and present their unique values and ideas to a group of people with similar academic backgrounds. "Graduate school is where I came to discover the depth of my passion for learning. It was evident in the way in which I continued to work at my degree while striving to maintain balance with my family life. On most days this was a challenge! However I was determined to maintain a joy for learning in addition to taking the time to enjoy my family. Graduate school is where I learned the importance of taking the time to appreciate every aspect of truly living this life I am creating for myself." As one of the leading universities in Canada, Simon Fraser University offers graduate programs in nearly every academic field. Supportive staff are available to help guide students to success. This page allows you to navigate all graduate programs available on-campus in depth. Below are the internal SFU awards, scholarships, and bursaries for Aboriginal graduate students. For additional external funding for Aboriginal graduate students, please visit this page. The Graduate Aboriginal Entrance Scholarship is currently valued at $18,000 per annum for Aboriginal doctoral students and $15,000 per annum for Aboriginal master’s students. Tenure of the award is two years at the master’s level and three years at the doctoral level. There will be one master’s and one doctoral scholarship awarded each year. To be eligible for consideration, a student must be planning to enter a thesis-based master's or PhD program at Simon Fraser University. Awards (up to $5,000 annually) are available each year to full-time Aboriginal graduate students. Students must be in good academic standing and also have demonstrated excellence in one or more of the following: service to the University, community service, cultural contribution, and/or overcoming personal or systemic barriers. The fellowship will be a single award of $13,800. The successful applicant will also have the opportunity to hold an SFU teaching assistantship during their studies. The purpose of the EMBA Scholarship for Aboriginal Leaders is to recognize and reward an outstanding Aboriginal student in the Executive MBA in Aboriginal Business and Leadership Cohort. One scholarship, valued at approximately $10,000 will be awarded over two terms (Fall & Spring). The scholarship is based on academic merit and is to be used towards the cost of tuition. Provides financial support for a First Nations or Aboriginal graduate student who is entering or pursuing graduate studies in the Faculty of Education, the Faculty of Arts & Social Sciences, the Faculty of Science, the Faculty of Health Sciences or the Faculty of Applied Sciences. The award is valued at a portion of the earned income and will be awarded annually. A $5000 annual fund is available for Aboriginal graduate students who wish to attend and present at academic conferences. Five awards of $1000 each are available in each acadamic year, on a "first applied for - first received" basis. In order to assist students to attend conferences, four travel stipends of $2,000 each per year are to be allotted to Aboriginal undergraduate or graduate students in the Faculties of Science or Health Sciences for use toward Health Sciences conference attendance and related travel expenses. Four grants of $3,000 each per year will be made available to Aboriginal graduate students enrolled in the Faculties of Science or Health Sciences who are undertaking research or practicum placements in Population Health or Biomedical Sciences. Available each term to entering and continuing Aboriginal students attending SFU who have a living connection to their Aboriginal community. Awards will be made to students in good academic standing on the basis of demonstrated financial need. The application should include a discussion of the student’s involvement in SFU or Squamish Nation community activities and confirmation of the student’s status with the Squamish Nation. The First Nations Student Association is located in TC 301 (in the Rotunda). The Indigenous Online Learning Community website highlights programs, student services, traditional events, and other support for self-identified First Nations, Inuit, and Métis students. The Indigenous Online Learning Community includes resources such as career journey stories, community stories, and volunteer stories. Supporting Aboriginal Graduate Enhancement (SAGE) is an interdisciplinary and cross-institutional peer mentoring program designed to support Aboriginal graduate students with the successful transition into and completion of their graduate programs. SAGE meetings are an excellent opportunity to meet other Aboriginal graduate students and to discuss research ideas, challenges, and experiences. The Elder's Program for SFU is located within the Indigenous Student Centre (MBC 1500). Program elders are in a unique position at SFU, one which recognizes the value and importance of the role of elders in the Aboriginal and university communities. The elders provide support and guidance to all students. On the other hand, the elders encourage cross cultural sharing and teach traditional protocols. The office's mandate under my supervision is to implement the Aboriginal Strategic Plan for Simon Fraser University. Aspects of this include recruitment, support, and retention of/for Aboriginal students; Aboriginal research initiatives; international engagement; community liaison and outreach to the Aboriginal community; academic program/course development in Aboriginal areas; Aboriginal knowledge and resource development; infrastructure/facilites development; and leadership development among Aboriginal people at SFU. We are campus-wide and community-oriented in our approach to getting the above done. Aboriginal students will, of course, benefit from the above occurring in the many ways that they are actually happening as we speak.